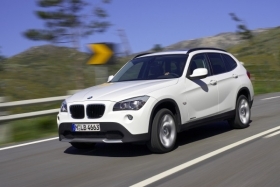 BMW expects its 2010 unit sales to rise due to new models such as the X1. MUNICH -- BMW AG vowed to remain the world's largest premium automaker as it forecast its car sales would rise in 2010 despite continued pressure from the global economic downturn. "We fully intend to remain the world's leading provider of premium vehicles in 2010 and plan to increase sales within the single-digit percentage range to over 1.3 million units," CEO Norbert Reithofer said in a statement on Friday. Unit sales at BMW group, which includes the BMW, Mini and Rolls-Royce brands, fell 10.4 percent to 1,286,310 in 2009. Sales at BMW brand were down 11.1 percent to 1,068,770 cars. "The BMW Group can start the new year with a certain amount of optimism. New models will provide tailwind over the course of the year," Reithofer added. The automaker has high expectations for the recently launched X1 small crossover and the upcoming debut of the new-generation 5-series medium-premium car, which launches in March. The company reiterated it expects to post a pretax profit in 2009 thanks to cost cutting and other efficiency measures. BMW said 2009 group revenue fell 4.7 percent to 50.68 billion euros ($71.2 billion). Revenue in its core automobiles segment fell 10.3 percent to 43.74 billion.